Fabric Paper Glue: Gettin' Old. Feelin' Fine. Bein' Selfish. Gettin' Old. Feelin' Fine. Bein' Selfish. Last Monday was my 29th birthday, and this week marks 7 years since I moved to DC from Nashville. Both of these milestones sort of blow my mind. I mean, I made our first mortgage payment on our condo last week. Our condo. In DC (well, Arlington, if you want to get picky). I never thought I would be in DC this long, particularly after marrying a hometown boy. Anyway, am I where I wanted to be at this age? Sure, I guess. I mean, I had no idea where I wanted to be. Actually, I do. I wanted to be married. I know, gag, but seriously, I went to a school that was informally known as "the marriage factory." So, yeah, I did that, and that's awesome. And I wanted a career. I have that. So, I mostly feel like I've met or exceeded expectations, and I'm not even a little bit disappointed with where I am. 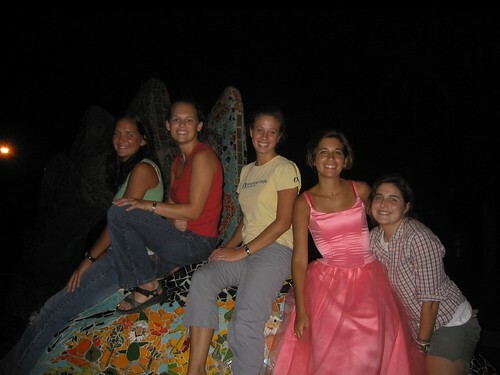 For one, I've come a long way from the pink tulle prom dresses I insisted on wearing for both my 21st and 22nd birthdays. 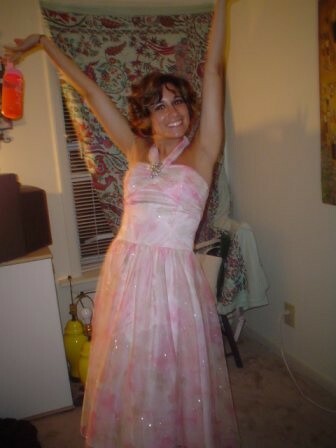 But I'm also proud of the fact that, at 29, I'd put one on again in a heartbeat (do you have any idea how much fun a pink tulle prom dress is?!). ...And, in case you were wondering, that is a pink mini-Nalgene bottle full of Vanilla Vodka + Tang in my hand, because I was classy. I lost that bottle that night, and I still miss it 7 years later. So, is this the point at which I'm supposed to make one of those 30 before 30 lists? I'm as goal-oriented as the next gal (see Twelve in 2012). Probably more so, but I can't think of any big life events or dilemmas that I'm just dying to experience or resolve before I hit the big 3-0. I mean, the biggest question that I see facing in the next couple of years is whether I should still be using the anti-blemish apricot scrub or make the switch to the anti-aging apricot scrub. I guess I should probably mention something about kids here. I've been married nearly 2 years and I'm pushing 30, so this is practically the elephant in the room where I'm from. On that front, yeah, I should start thinking about having a kid(s). The fact that I haven't even started really thinking about these things will probably instantly put my mom and mother-in-law into fits of despair. After all, my mom's toast at our wedding was pretty pithy: "Congratulations. Now, have me some grandbabies." I'm still so selfish, though. What about you? Do you feel pressure from perceived milestones? Do you ever think back about where you thought you'd be by now and how you stack up to that? I'm pretty satisfied with your progress as well. And I think you guys should have kids soon. I think it is better to have a bunch of friends in the same life stages so we can all understand each other (If I can't come out and drink all night long because I have to be home for Nate's bedtime at 7:30, it is better if you understand where I am coming from). Plus emotional support - or at least understanding. I'm surprised to still be in school, myself. I would like to have a decent paying job soon. But the longer we wait, the more likely we'll have ready-made babysitters in all y'all's kids! It's true, though. I have a hard time relating to my baby-laden friends sometimes, and I think Michael even moreso. I turn 31 on Saturday, I've been married 9 years and we don't have kids yet. I think everyone has given up on us. ha ha. they don't even ask anymore! But I do finally feel ready for that. I'm glad I had a decade with my husband before I had to decide. And c'mon - 30's are the new 20's! so I say take your time and don't feel pressured into preconceived milestones. :) I'm a goal-oriented person...I made my 30 before 30 list out of things I mostly planned on doing that year anyway. ha ha. Hooray for you guys! I like my time with my husband, and I'm just not yet ready to share that with someone else. I'll get there, but just not yet. And I totally agree -- it's the new 20s, for sure! This is such a lovely post! I had my birthday last week too, and it really does get you thinking about goals and the future! I guess it's a good reminder to keep you on track to where you want to be! Aw, thanks! Honestly, Kate, I found my earlier birthdays (i.e. 10th - 25th) much more thought provoking. Now, I'm just me, doin' my adult thing. I won't be getting any new legal privileges or freedoms or undertaking any huge life events (other than maybe babies at some point, which is of course HUGE). Those earlier birthdays are scary...but so fun! So enjoy them! i have never made a list and every time i read something like this i think, maybe i need to be more ambitious? even so, i've managed to get my master's (which i didn't consider until the year before i applied), start a career, and get married. i always thought i'd get married around 30 (but ended up married at 24) and never ever thought about kids. i guess we should start thinking about kids ha. but we DO maintain a giant word document of all the cities in the world that we want to visit. priorities, you know. Erin, you're definitely an adult...like it or not. And, yeah, you should start thinking about kids now. Hahahah. Oooh, volunteering. That's a good one. I should probably become more selfless, too, but I mean, it's right in the post title -- I'm selfish. I made a 30 before 30 list primarily to keep myself from putting off things I have been wanting to do for years and to put a timeline on making some real lifestyle changes. I know your precious heart is sensitive to what other people want for you, but please don't let your family or friends with kids pressure you into having children or making you feel guilty for not immediately doing so. You're doing great things now, and you'll do great things when you have kids too...whenever than may be. Maybe you should make a before kids list. I think "a trip to Salt Lake" would be a good thing to add. Just sayin'. I don't feel pressured. If I did, I would've been pregnant within weeks of getting married. If I've held out this long, I can hold out longer. ...BUT a before kids list sounds awesome! We actually sort of have an informal one of those going, now that I think about it. Actually, I might be coming to SLC in January. Stay tuned. This post made me laugh, because I have had that exact thought about when do I get to stop using acne face stuff and graduate to anti-aging face stuff? As far as living up to what we thought we would be when we became "grown-ups"... I had my own issues with that the last two years and then I found this quote: "We must be willing to let go of the life we have planned, so as to have the life that is waiting for us." -Joseph Campbell. After I read that I gave up trying to live up to my own expectations and just decided to let be and have fun! Good luck and happy birthday! Happy, happy birthday, a few days late. I think it's lovely to see you where you are now, and it does my heart good to see you so content. And AMEN to what Sheena said. I am 32, I had 2 kids in 4 years of marriage, and there are days I miss my husband so much that I almost can't stand it. Don't let anyone else tell you when to start. And in the same vein, you're never *really* ready for how much it changes your life, so… Whatever. Take your time. Does this mean I should make a 40 before 40 list? Or do I wait till I'm 39 to do that? Yeah, man, you have to get on that now. 40 things is a lot of things to do. Particularly if they're things you've been putting off. I loved your post! I haven't made any sort of lists for myself, or really reflected a ton, but my birthday is in January, so I'll save it for then. Pink dress #1!! I think that made more appearances than just that night. Joel likes to tell people we've been trying to have kids for 5 years. That shuts them right up. I absolutely love this post! I feel very similar about turning 29. It's funny to think back to what you thought your grown-up life would be like when you were a kid. I feel like being an adult is so much more fun than I imagined. A list of things to do before kids is an awesome idea, I may have make one myself. I look forward to finding out if you decide to go for the anti-aging face scrub, I have asked myself the same question recently. Please let us know what you decide!